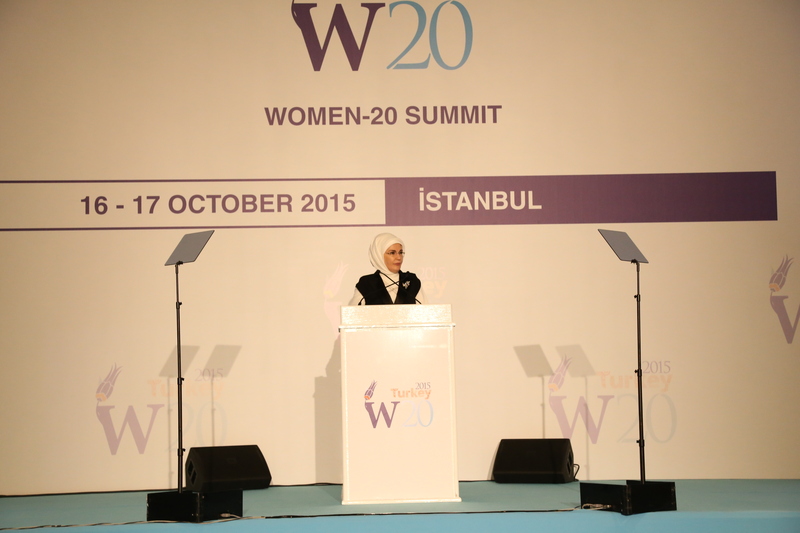 W20 was officially launched with hundreds of participants from 60 countries. 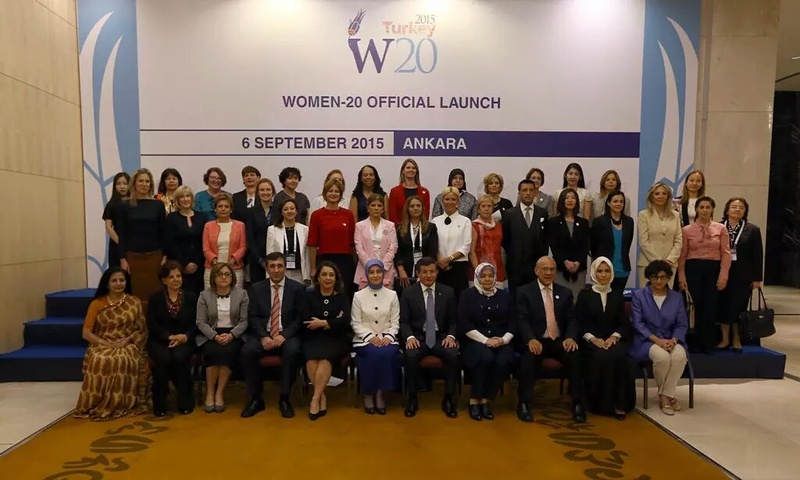 W20 which is one of the outreach groups under G20 was officially launched with participation of prominent representatives of financial world. 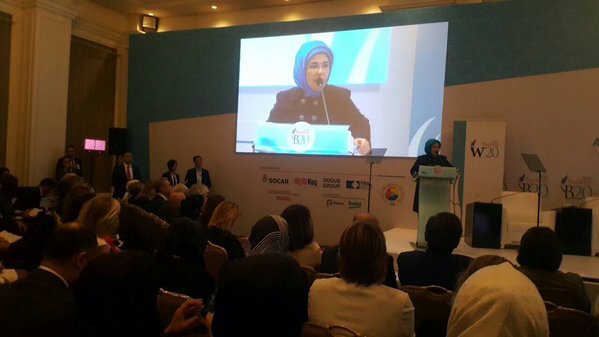 The event was started with Turkish Prime Minister Ahmet Davutoğlu’s speech. 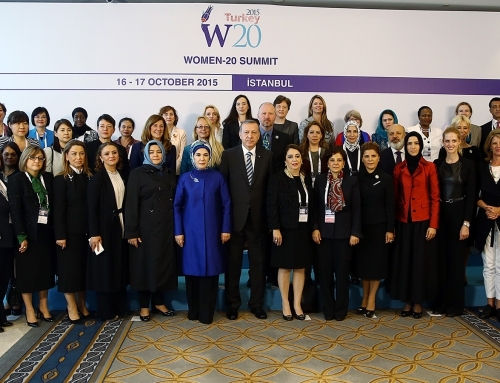 KADEM is also one of the committee members of W20 with two other NGOs KAGİDER and TİKAD. G20 sharpa of Turkey Ayşe Sinirlioğlu, Managing Director of International Monetary Fund Christine Lagarde, Secretary-General of The Organisation for Economic Co-operation and Development Angel Gurria, Deputy Executive Director of UN Women (TBC) Lakshmi Puri and Executive Director of International Trade Center Arancha González also participated in the event. At the event, participants gave their speeches on important issues about women’s participation in economic and social life. 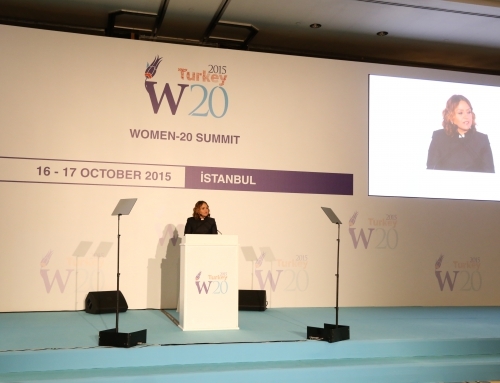 Within this framework, Ayşe Sinirlioğlu said that “integrating 100 million women to business world until 2025 is our main goal and very important for us. We also need a strong accountability mechanism here. 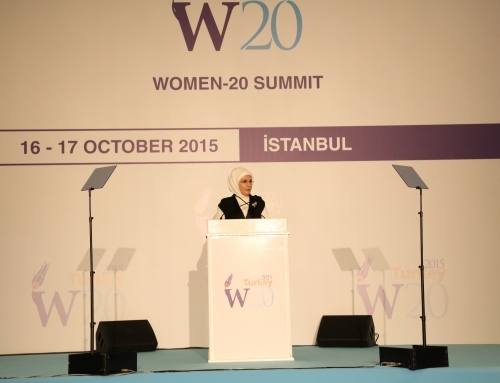 As W20 committee, you can control the whole G20 if they keep their promise or not”. Subsequent to Sinirlioğlu, Prime Minister Ahmet Davutoğlu got on the stage to give his speech. 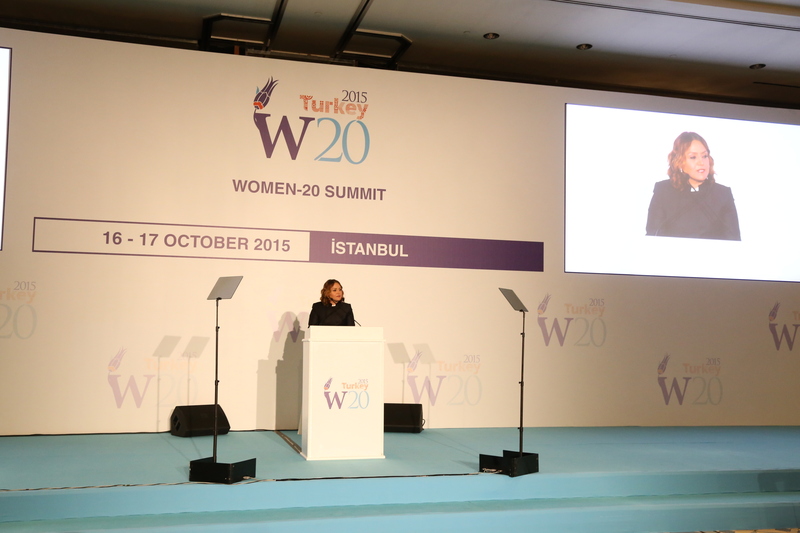 In his speech, Davutoğlu mentioned the importance of W20 for Turkey. He also pointed out that without women’s participation in economic life the world economy will fall down. 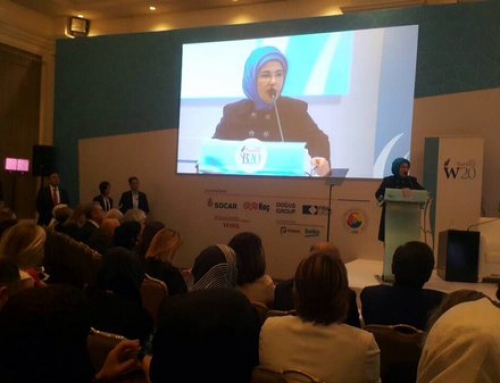 After the opening speeches, the sessions with the titles “Women in Financial World”, “Women and Trade” and “Women and Technology” were carried out. Within the sessions “that general president of KADEM Sare Aydın Yılmaz, Australian Research Council Future Fellow, Asia Pacific College of Diplomacy, ANU College of Asia and the Pacific, Australian National University academician Susan Harris Rimmer and Chief Economic Empowerment of UN Women Meg Jones moderated, Board Member of Sentim Bilişim İffet Polat, Vodafone Turkey CEO Gökhan Öğüt, GE. Turkey CEO Canan Özsoy, EY EMEIA Accounts Leader Julie Teigland, Lead Economist of World Bank Group Pierella Paci, IMF Assistant Director of Strategy Policy and Review Department and Head of Gender Advisory Group Catherine Pattillo, Esra Kıvrak from Garanti Bank, Executive Vice Presidency of Wells Fargo Bank Dilek Mutus, Senior Director of Women’s Empowerment Program of The Asia Foundation Carol Yost, Accenture Deputy Chairperson and Chief Executive Officer Camille Mirshokrai and Chief Adviser of Austratian Treasury Hk YU made their presentations. “Enhancing women’s participation in development is essential not only for achieving social justice, but also for reducing poverty. Therefore, supporting more women to participate in working life contributes to economic growth, it also improves overall family health. In short, investing in women is central to sustainable development”. Despite these known truths, women still face many barriers in contributing to and benefiting from development in this era. There are structural, legal and regulatory barriers. But we believe that women must have more equitable access to assets and services and equal employment opportunities should also be improved. All in all, we need remarkable economic and social gains for women by advancing women’s empowerment through a fair implementation of rights. And this is only possible by implementing gender inclusive approach to all spheres in the society. In order to construct strong and developed economies and societies, it is important for women to have economic and social rights. We need well-implemented economic and social policies developed for increasing women’s status and civil society has much to do at this point. Because implementing these policies requires more than legal reforms. We have achieved a lot till today like family packages and flexible working hours. However, we have a lot more to do going forward. All in all, there is a global effort to overcome all these barriers and increase women’s participation in public life. 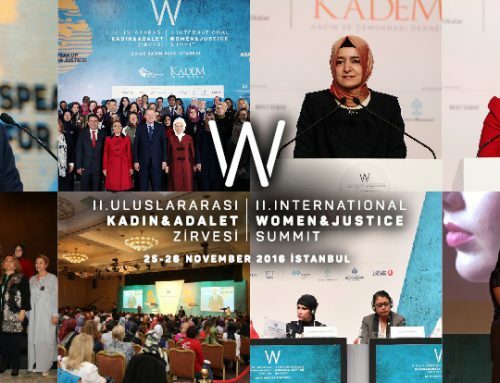 W20 is one of these mechanisms to bring together national and international women NGOs and think-tanks to empower women and find out solutions for women’s active participation in economy. As an output, an action plan for reducing pay gap between women and men will be prepared afterwards. After the third session, the program has finished with closing statements and family photo. 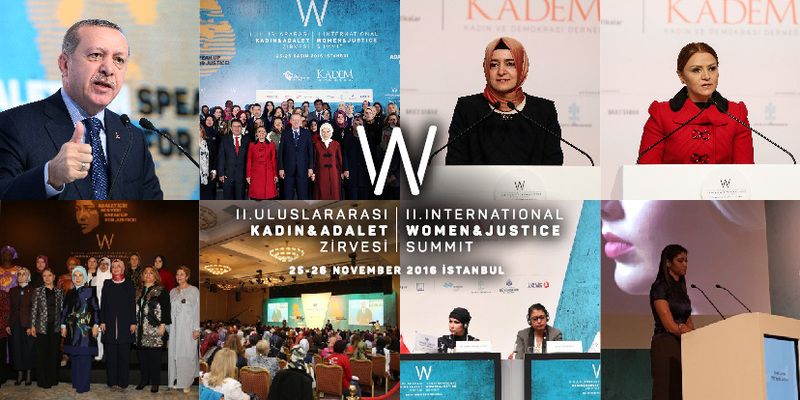 W20 National Consultation Meeting will be carried out on September 11 and W20 Summit will be held on October 7-8 in İstanbul.